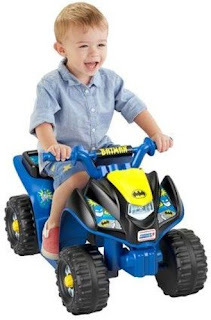 HURRY over to get this Power Wheels Batman Lil' Quad for ONLY $49.99 Shipped (Retail $94.99)! The Power Wheels Batman Lil' Quad vehicle combines sporty ATV styling with awesome toddler-friendly features! This vehicle is designed specifically for toddlers with easy push-button operation and comfortable footrests. 6-volts of battery power provide a fun, but safe 2 mph maximum speed. And it rides low, so it's easy for little ones to get on and off by themselves. It's as sturdy as it looks – and just as much fun to drive too!